The African continent is synonymous with its distinctive music and dance culture. 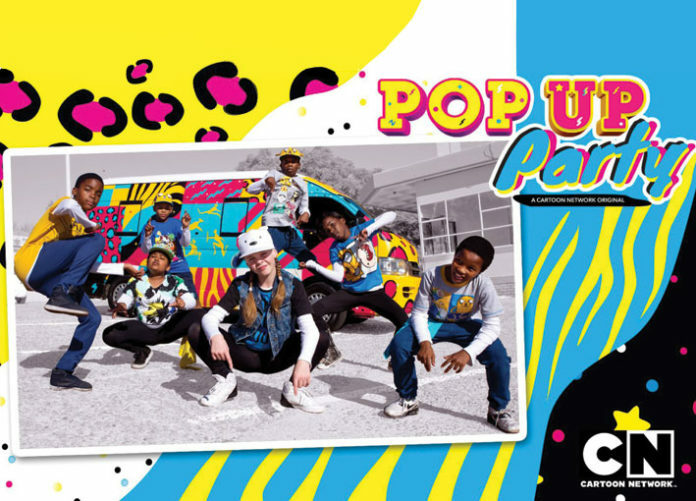 Cartoon Network – the most watched kid’s entertainment channel in Africa – and Urban Brew Studios, renowned African content creators, have joined forces to create the new and original locally produced kids’ series Pop Up Party. The series, which is the brainchild of Ariane Suveg, the programming and acquisitions manager for Turner Kids’ channels in Africa, was developed in a collaborative effort with Urban Brew Studios. “The initial task was to find a common denominator among Africans, specifically among the youth. The one thing that all Africans do when they are happy, sad or angry is dance. Rhythm is in our souls, and with what these kids do, they remind people that sometimes it’s good to just let loose, pop up and dance and so, Pop Up Party was born,” says Urban Brew Studios’ spokesperson Markus Davies, who is the executive producer of the series. The first season of Pop Up Party, which has been airing on Cartoon Network (DStv channel 301) since 23 July, comprises 10 short inserts which follow a young team of enthusiastic local dancers as they ‘pop up’ in unexpected locations and start to dance, creating an energetic atmosphere and a fun-filled Pop Up Party. The new series draws inspiration from the countless viral dance and flash mob videos that have risen in popularity and taken the internet by storm over the past couple of years. In an attempt to find the perfect mix of dance pro enthusiasts, the show’s creators stumbled upon the Michelle Oppenshaw Dance Studio, which is run by Oppenshaw, a well-known dancer and choreographer. The talented and culturally diverse young dancers that feature on Pop Up Party were all cast from the studio. “We found a group of talented individuals who love to dance, who spend their free time in the dance studio, and invited them to participate in our Pop Up Party,” explains Davies. “We drew our inspiration from pop art, shweshwe (a traditional printed, dyed cotton fabric) and of course, from traditional African arts and crafts, and the printed fur of some of Africa’s most iconic animals ie. the leopard. The bright, flashy colours and pop art inspired artwork, evokes a sense of excitement, energy and joy in the air – the perfect atmosphere for one heck of a party,” comments Suveg. In terms of filming style, Pop Up Party employs a fast paced flair, to best capture and reflect the high energy of the crew. To further enhance the modern African undertones in look and feel, Cartoon Network teamed up with the choreographer and parent of each cast member, in order to create a bright, individual, African street-inspired style specific and authentic to each individual’s character and personality, while remaining true to the channel’s artistic style and aesthetic. Pop Up Party is a ‘hidden camera concept’, filmed in an unscripted, unplanned environment. For this reason, the cameramen hid in strategic locations, concealed from the public and audience’s sight in order to best capture the energy, surprise, spontaneity and authenticity of the audience and crew on camera. “Some of the filming was captured ‘handheld’ style, also known as ‘shaky cam’, which is a technique we used to give the series a documentary/reality sort of look and feel. We really wanted to portray the unpreparedness and unrehearsed nature of the reality-style series, which is exactly what Pop Up Party and its crew is all about,” Suveg expands. Urban Brew Studios offers television production, outside broadcasting, content generation, branded content, channel management, graphics and more.